Chantell Joy Balaan, PhD candidate, is pictured in the lab. 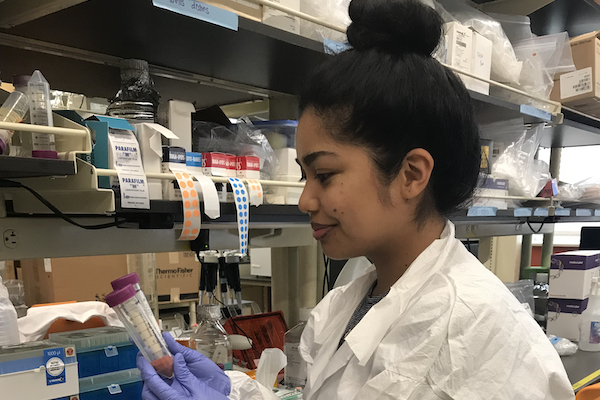 Chantell Balaan, a University of Hawaii (UH) medical school PhD student from Koloa, Kauai is the 2019 winner of the ARCS Award in Medicine. Balaan, raised on a farm, is the first in her family to attend college and she has made the most of it. She has two bachelor’s degrees from UH Manoa (UHM), a master’s degree and is not far earning her doctorate from the UHM John A. Burns School of Medicine (JABSOM). Balaan will present her current research on April 13 at UH Manoa to Honolulu ARCS members and will be presented their award in a ceremony on May 6 at the Outrigger Club in Waikiki. We asked this award-winning young scientist a few questions to get to know her a bit better. UH Med Now: Tell us about yourself. My name is Chantell Balaan and I am a 3rd year PhD student in the Developmental and Reproductive Biology Program. I attended Kauai High School on the island of Kauai and completed both my Double Bachelor’s degrees (Biology and Religion) and Master’s degree here at the University of Hawaii. UH Med Now: Describe what your educational goals are, and what has been most exciting in your line of study at JABSOM. 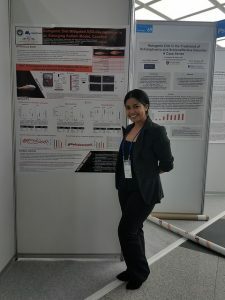 Chantell: My educational goals are to complete a PhD degree with emphasis on understanding the interplay between gut microbiota, brain-gut bidirectional pathways, and metabolome in Autism Spectrum Disorder (ASD) etiology. The most exciting part of my work is implementing an evolutionary model system, Astyanax mexicanus (species of teleost with 2 distinct morphs: surface and cave morphs) to study ASD. We hope to incorporate a lot of interdisciplinary knowledge in the long-run. UH Med Now:What do you like most about the people, project or line of work you are involved with? Chantell: Hands-down, I have the best colleagues ever (Special shout-out to Vania Felipa Lima Fernandes, Mclean Worsham, and Kimberly Lactaoen)! We are all very excited about our model system and we are always reaching out to each other whenever we have questions about our project/ experiments. It is also great that many of our undergrad volunteers are funded by the Undergraduate Research Opportunity Program (UROP), so we all have a chance to extend our knowledge and experiences to undergrads. We are also appreciative of our PI, Dr. Masato Yoshizawa for his mentorship. Chantell: When I am not in the lab or grading papers, I try to do as much physical activity as possible such as hiking and going to the gym. Balaan in front of one of her research posters. UH Med Now: What is your favorite spot in Hawai’i, and why? Chantell: My favorite spot in Hawaii is my hometown, Koloa on the island of Kauai. I spent most of my childhood there and I grew up on my family’s farm where our primary crop was kalo (taro). It was here that I believe I honed my observational skills that I utilize as a behavioral scientist as I spent many days in my childhood observing native flora and fauna. UH Med Now: What is your favorite place outside of Hawai’i, and why? Chantell: My favorite place outside of Hawaii would be Seattle, Washington where my older brother, Cheston, currently resides. I enjoy how it contrasts to Hawaii; however, I appreciate the cultural atmosphere of the Pacific Northwest. UH Med Now: What else would you like folks to know about you? Like many other students, I am a first generation college student who is learning as I go. I am very lucky and grateful for the faculty and staff who have enabled me to pursue higher education here at UH and at the John A. Burns School of Medicine (JABSOM). I would like to acknowledge those who have made a huge impact in my academic growth. I would like to give special acknowledgement to the ARCS Foundation for the award. I am truly thankful for everyone involved! I hope that my story will inspire other students to pursue their goals! The ARCS (Advancing Science in America) Foundation is a non-profit organization administered by a group of women, who provide scholarships and awards to support graduate and undergraduate students in science.